This illustrated interactive book teaches fun drawing exercises following the principles of the drawing method Zentangles. The Zentangle concept was started as a way to practice focus and meditation through drawing by using repetitive lines, marks, circles and shapes. Each mark is called a "tangle," artists combine various tangles into patterns to create "tiles" or small square drawings. This step-by-step book is divided into six chapters, each with seven daily exercises. 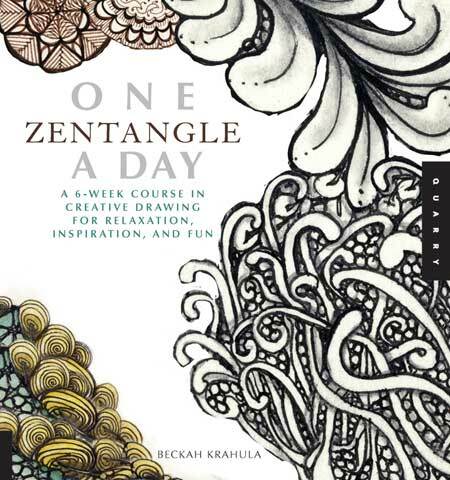 Each exercise includes new tangles to draw in sketch books, teaches daily tile design, offers tips on related art principles and contains an inspirational "ZIA" (Zentangle Inspired Art) project on a tile that incorporates patterns, art principals and new techniques. 128 pages.